Once again, Alan Bandy has posted something that really got me thinking. 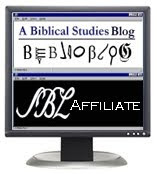 He just put up an interview with noted biblical scholar Craig Bloomberg, in which he discusses faith-based scholarship. This essay had a profound impact on my thinking when I read several years ago. Click here for the whole article. This is a great blog. I hope more people discover it. That is very interesting. The history of scholarship definetly plays a role in the exegesis of texts. My question, however, is what does he mean by diachronic exegesis? Diachronic is contrasted with synchronic. "Diachronic language studies look at the development of a language over a period of time." "A synchronic approach looks at language at a particular point in time, rather than over time."